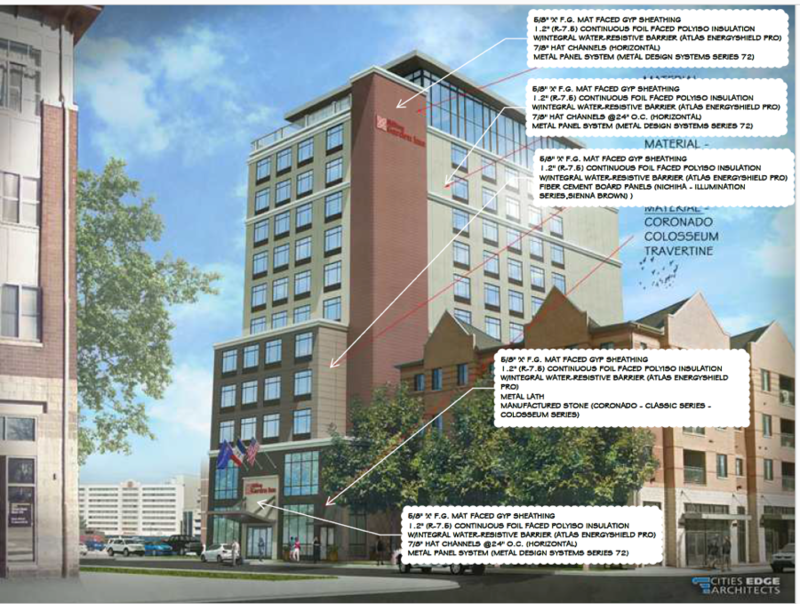 In the fall of 2015, Rushton Sheet Metal, a contractor specializing in architectural sheet metal and wall panels, and Cities Edge Architects, a local architecture firm, began evaluating insulation products and solutions for a large hotel build in Iowa City, IA. The Hilton Garden Inn, a modern 12-story high rise that will open in summer 2017, is a high-profile project due to its prime location on the University of Iowa campus as well as the distinct architecture of the new building. The insulation needed for the construction will cover 55,000 square feet. The team required an insulation solution to serve three primary performance and application objectives, including acting as a thermal, air and moisture barrier. With an Atlas EnergyShield Pro solution, all of these requirements will be addressed with one single product. Located in the heart of Iowa City, the high-profile Hilton Garden Inn had to be built to last. Rushton Sheet Metal and Cities Edge aimed to use only the best quality products to ensure high performance for the life of the building at a budget-friendly price. To accomplish this, they would need an insulation product that could serve as an energy efficient thermal insulation and a water-resistive and air barrier for the steel-framed building. Using an insulation product as the building’s water and air resistive barrier would reduce material and labor costs, but it posed the additional challenge of seamless installation and taping to create a fully functioning envelope. After consulting with architectural specialists at Atlanta-based company Atlas Roofing Corporation, the team chose to utilize EnergyShield Pro wall insulation. Not only did EnergyShield Pro meet the project’s rigorous technical requirements, but Atlas has a proven track record of providing excellent customer service and quality products. In addition, the decision to choose Atlas was influenced by the readily-available quantity of product and proximity of the Atlas plant to the project site. 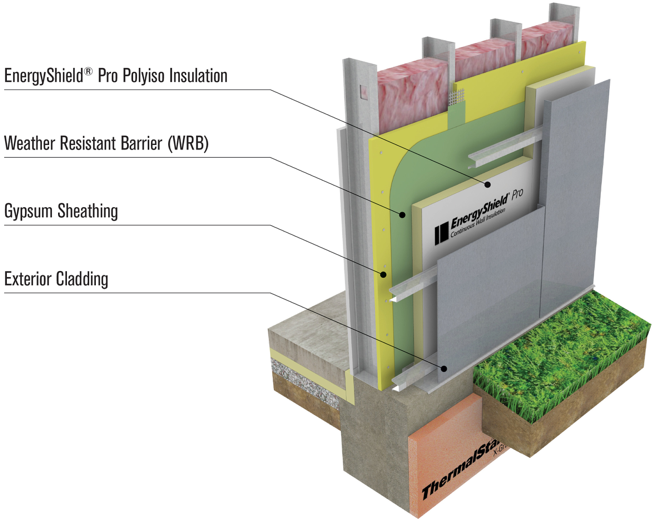 EnergyShield Pro wall insulation combines high R-value, durability and water resistive barrier attributes in a high performance continuous insulation. It is composed of a Class A fire-rated, closed cell polyiso rigid foam core faced with an embossed white acrylic-coated aluminum foil facer on the front and a reflective foil facer on the back. By choosing a multifunctional product, the designers and installers will save in both up-front costs and labor by reducing the need for three different products to one, and eliminating the extra installation steps required for these separate products. This example illustration visually depicts the location of Atlas manufactured materials in relationship to other materials in a wall assembly. EnergyShield Pro is available in various thicknesses and R-values. For the high-rise Hilton Garden Inn, Rushton Sheet Metal chose a combination of 2.5 and 3-inch thick insulation. The majority of the building will be insulated with 2.5-inch EnergyShield Pro, which has an R-value of 16. The remaining portion will be insulated with 3-inch EnergyShield Pro, which provides an R-value of 19.7. With these high R-values, the building will be more energy efficient and provide a higher resistance to heat transfer. This ensures long-term performance of the building. Continuous Insulation (CI) for wall applications provides a new and better way to build exterior walls and adheres to the U.S. model energy codes and standards, including the International Energy Conservation Code (IECC) and ASHRAE’s Standard 90.1-2010. Continuous Wall Insulation provides an uninterrupted thermal barrier over an entire wall, not just in wall cavities between studs. Building science has proven conclusively that CI is the most effective way to insulate building envelopes for energy savings. Insulation that is continuous across all structural members without thermal bridges, other than fasteners and service openings, is critical. In this particular installation with the Hilton Garden Inn, the polyiso rigid foam board is installed on the exterior of the studs and gypsum board. Rushton Sheet Metal Employee installs Atlas products during mock-up wall training. Choosing to divert from the standard wall system where an insulation layer is simply intended for thermal efficiency with separate layers for water and air resistive barriers, the team had to ensure that the single layer was installed, sealed and secured properly. To ensure that these critical processes were completed to manufacturer specifications, Atlas, along with the architect, contractor and other key manufacturers, participated in a mock-up wall training for Rushton Sheet Metal employees. During this in-depth training, participants built a small section of the wall to completion, including adding the insulation, caulks and sealants for the joints and adding the attachment systems and cladding. This mock-up installation demonstrates the cohesive system working together and provides tremendous value and learnings before the actual installation, as well as ensuring there’s no leaking in the seams. 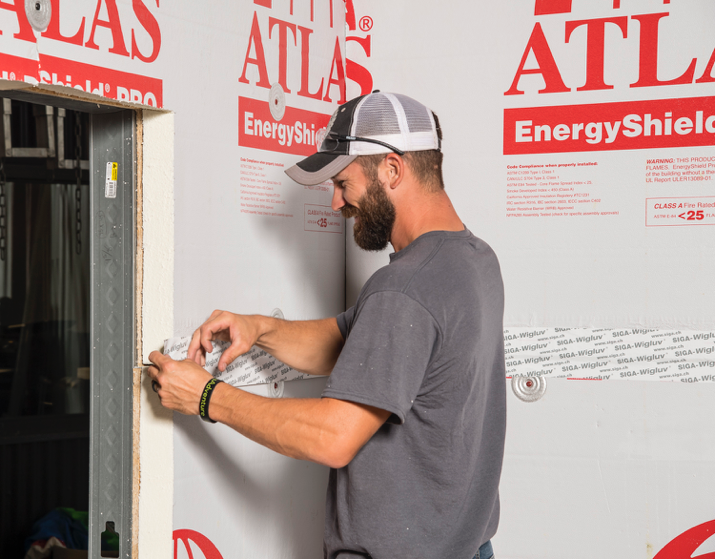 This wall build training was overseen by Atlas and other installation specialists to ensure the contractors knew how to secure the insulation. The wall was inspected and approved by the contractor and architect before the final project took place. The high R-value of EnergyShield Pro and the efficient use of the polyiso rigid board insulation on the outside of the studs (vs. cavity insulation), ensures the cooling and heating efforts in the hotel will stay inside of the building. By utilizing EnergyShield Pro to its fullest capability, Rushton Sheet Metal is saving on time, space and labor costs. The finished build will result in an energy efficient structure with long-term performance. The Hilton Garden Inn is scheduled to open in the summer of 2017. Preliminary Rendering of Hilton Garden Inn, Iowa City.